ReutersAn employee prepares a food order for customers at Burger King. Burger King just posted its biggest quarterly same-store sales increase in North America in two years. Sales at stores open at least a year in the US and Canada rose 3.6% in the third quarter compared to the same period last year. Globally, same-store sales increased 2.4%. That’s a stark contrast to rival McDonald’s, which recorded a 3.3% decline in global same-store sales over the same time period. Burger King swung to a profit loss of $US23.5 million for the quarter, however, compared to a profit of $US68.2 million the previous year. The loss is due in part to Burger King’s $US11 billion acquisition of Canadian coffee-and-doughnut chain Tim Hortons. Total operating costs and expenses more than doubled to $US278 million for the quarter. Revenue rose 1.4% to $US278.9 million. Analysts were expecting revenue of $US281.8 million. The company said its sales growth was driven by the reintroduction of Chicken Fries during the quarter, as well as the continued popularity of the limited-time BBQ Bacon Whopper. 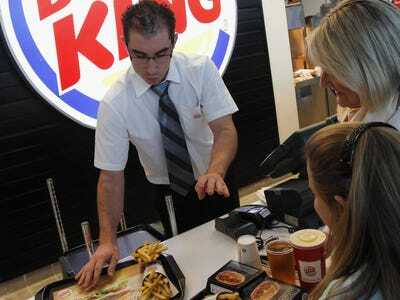 Yahoo FinanceBurger King shares have soared in the last year. Schwartz has engineered a total restructuring of the burger chain over the last year. He simplified the chain’s menu to speed up service and he made franchising easier for overseas restaurants, leading to a rapid international expansion. He has also helped reduce Burger King’s corporate headcount to 2,425 from 38,884 by refranchising restaurants, meaning those workers now report to franchise owners.